n. Open land where fairs or exhibitions are held. This definition was not enough for me. To me, it did not describe the true meaning of Fairground, or the exact feeling and essence the Blue Moon gals were trying to get across when they created this richly appealing and colorful yarn. To me, a fair states youth and games and popcorn. My memories include games of throwing a dime in a glass, knowing it would never land in that glass, but always hoping it would, by some slim chance, just so I could win that gigantic stuffed bear and get cheered on by my friends. There were also the "throw the dart at the balloon" games, basketball throwing events, and pretty baby competitions. Not to mention the dairy goat cheese contests, the jr livestock auctions, and the hot dog and pie eating festivities. 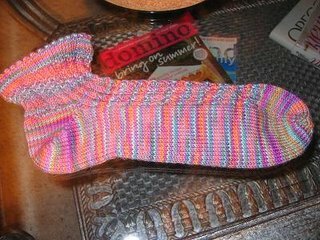 In knitting this Fairground sock, I wanted to give it a Fairground feel. I wanted to make it fun and festive and memorable. Most of all, I wanted it to remind me of the fair I had experienced as a child, and all the fond memories I still hold of the fair today. 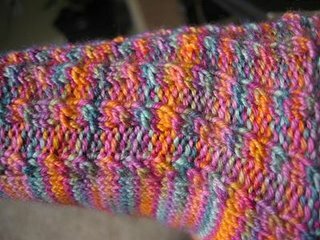 So, without any further rambling on, here is my first Fairground sock, shown in many lights (please note, I did not follow the pattern that came with the yarn this time, as I wanted to express myself differently with this one). 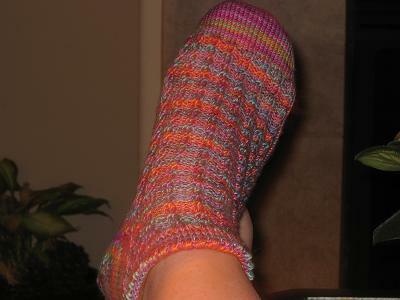 I used the Baby Cable Rib pattern from Sensational Knitted Socks and included a picot edging on the top of the sock. Also, I ended the socks just at ankle length, as I'm beginning to realize that I love my socks this length. Very comfy, simple, cute and easy to wear! Is it toe up? I can't tell from the photos. It is really adorable! I want some of that yarn! Yes, it's toe up! It's really awesome yarn from the sock club! love the reflection on going to the fair, wg. 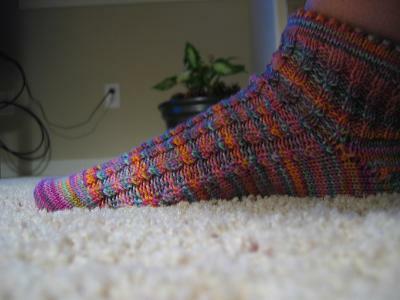 the sock is fantastic - oooooh, those colors, and ooooh, that pattern you chose! Amazing Lace X-treme Challenge #2! KNITTERS IN PUBLIC SPOTTED IN PORTLAND, OREGON!